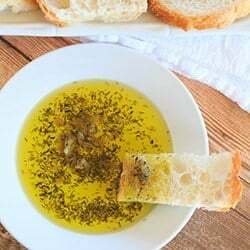 An easy and simple dipping oil infused with roasted garlic and herbs. 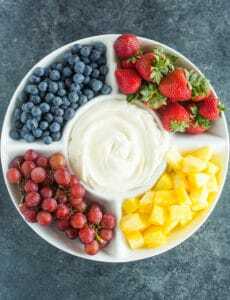 A perfect light appetizer! 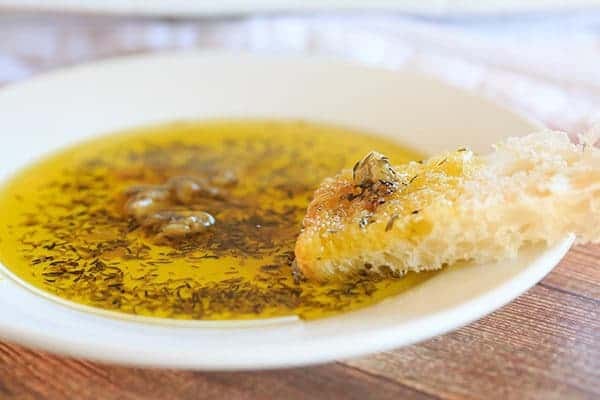 It’s not uncommon to go to an Italian restaurant and be served fresh bread with a plate of dipping oil in lieu of a traditional bread basket. While I’ll never turn down bread, I didn’t become fully enamored with dipping oil until I had it at a local winery quite a few years ago. It was better than any dipping oil I’d had before, and I must not have been the only person who thought so because it turned out that they actually sold bottles of the stuff! My husband and I were there with another couple and all we all bought bottles of the dipping oil to bring home. We blew through it in no time and for some reason, it never dawned on me to MAKE MY OWN. Why?!?! Fast forward what seems like a gazillion years, and my grandma emailed me a recipe for dipping oil that she said she and my grandpap loved. It was all the motivation I needed! 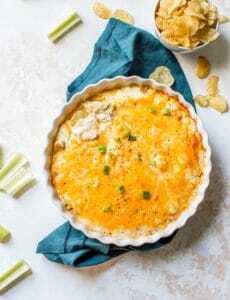 The original recipe that she sent called for peeling the garlic and cooking it uncovered at a lower temperature, which basically infuses the olive oil, but renders the garlic useless once it is done since it dries out. I preferred to basically do a traditional roasted garlic with the dried herbs so that I could mash it up and use it in the dipping oil. All you need is a loaf of crusty Italian bread and you have a great appetizer (or a TV-watching snack!). 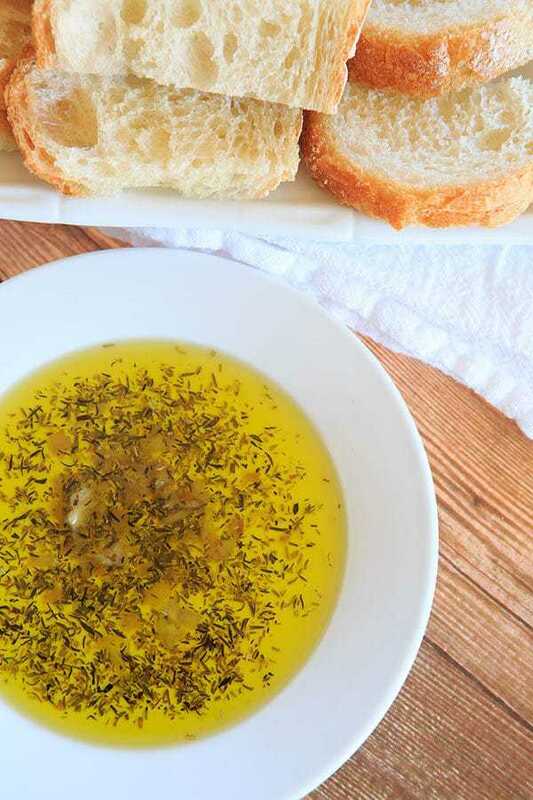 An easy, flavorful dipping oil, perfect for light appetizers! Preheat oven to 350 degrees F. Slice the top off of the head of garlic, just exposing the top of the garlic. Place the garlic, thyme and rosemary in a small, shallow baking dish and drizzle the olive oil over the garlic and into the baking dish. Cover tightly with foil and bake for 1 hour. 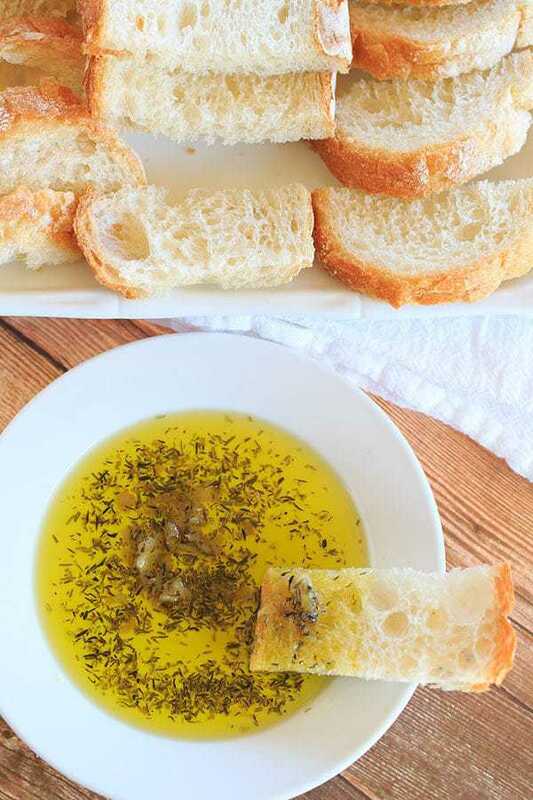 I love Italian Bread and the dipping oil is fantastic. Love all these kinds of recipes. I remember my grandma introducing me to dipping oil after she’d had it at an italian restaurant. I’ve made it at home before but it has only consisted of herbs mixed in the oil which is, needless to say, nowhere near as good! I will have to add this to my list of yummies to try! This may or may not be planned for my next dinner…. and nothing else. Just this. No kissing after! Wegman’s makes a really good dipping oil – actually they call it a “basting” oil, I like it because the herbs aren’t left as crunchies as some oils or herb mixes for dipping oil are. I wonder if you have to saute the herbs in the oil to soften them? I like to sprinkle a little Parmesan cheese and hot pepper flakes on top. Hi Lynne, I do not sauce the herbs and had no issues with them being crunchy. Enjoy! 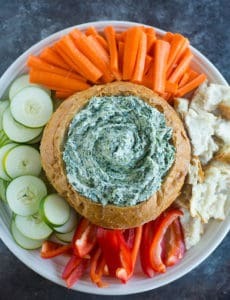 This is an amazing appetizer for a family gathering and also I can only image it with a glass of red wine… great dip!